The University of Sydney conducted a clinical research trial into the effects of a non-diet program. Their results were a world first. This program used the principles and ideas from the Diet No More Book and the Nectar Course developed by psychologist Judith and daughter Jenny McFadden. 83 women who were chronic dieters and who had found dieting unsuccessful long term were involved and monitored over a 12 month period. They were taught the principles of natural eating in the 6 week program. Although not an aim of the program, natural eating and weight loss correlated at the .01 level of significance. In other words, weight loss was a side effect of learning natural eating. It was discovered that 4 in 5 those who had adopted the principles of natural eating (those in the often and sometimes categories and for whom weight loss information was available) had either lost weight or found their weight had stabilised. Less eating occurred for reasons like emotions, stress etc. Less feelings of “I have to control myself”. More eating according to their body rather than eating prompted by the sight of food or just because it was “time” to eat. More confidence, strength of belief in themselves. More at ease with their own bodies, more accepting and comfortable. Dramatic changes in all the measures of self esteem, body image, emotional eating and restrained eating were obtained and maintained over the first 6 months. Then something unexpected occurred. In the second half of the trial period (ie in the subsequent 6 months) the results suddenly dropped again even though no other intervention was used. Anecdotal evidence supports the idea that once the women felt confident the approach was working they then took on the ideas further and this increased the strength of their results. No dieting was involved. The women were free to choose what they ate while they were learning to restore natural body signals. Most of the women had been yo-yo dieters who had been used to constant weight fluctuations - up and down. Many feared that being free to choose their own foods with no restrictions would lead to increases in weight. This did not prove to be true. 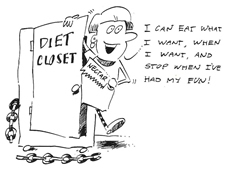 Previous dieting strategies have been based on deprivation and willpower as the main tools for weight loss, however long term results have been extremely poor with over 95% of those regaining the weight. 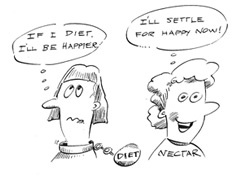 In 1996 The University of Sydney conducted this clinical research trial into the effects of a non-diet program they called “Freedom From Dieting.” This program used the principles and ideas from the Diet No More Book and the Nectar Course developed by psychologist Judith and daughter Jenny McFadden in Sydney. principles, containing activities from the Nectar Course. The aim of the program was to free subjects from dieting by using the principles and psychology from the Diet No More program and to teach them to behave as natural eaters. 83 women who had found dieting unsuccessful long term were involved and monitored over a 12 month period. They were taught the principles of natural eating in a 6 week program, once per week for 6 weeks in groups of about 20. All women did a pre-test questionnaire, post test questionnaire, then a 6 and 12 month follow up. At the end of the 12 months each was asked to rate themselves as “often, sometimes or seldom” natural eaters. They then compared the results of these tests with these rankings. The team developed a six session teaching program based on Diet No More principles, containing activities from the Nectar Program. them to behave as natural eaters. Results are published in The International Journal of Psychology and Health Vol 13, 1998. "Changing the Body Image Concerns and Eating Behaviour of Chronic Dieters: The Effects of a Psychoeducational Intervention") The original journal article is copyright and cannot be distributed by Nectar however you can read an article from Judith McFadden and Les Higgins about the research. The results of this study confirm that the freedom of a non diet approach, when combined with teaching “natural eating”, did not result in feared weight gain and instead made it possible to achieve weight loss and stabilisation. No deprivation was required and the weight changes had continued over the 12 months. The findings of this study are highly significant for anyone who has had a battle with their weight and found that diets have not been successful in the long term. Weight lost is usually regained and low self esteem and loss of confidence results. Body Image, Self Esteem and Emotional Eating are important factors in weight management. This study clearly sends a message that there is a connection between body image, self esteem and emotional eating and weight management. They go hand in hand and successful management of eating behaviour and weight issues must address these areas. This research gives enormous hope to all who want to lose weight without dieting, able to eat what they choose, learning to restore a natural way of regulating body weight, living a life free of fear of gaining weight and restoring confidence, freedom and power. The Nectar Course offers this hope.